The Ratchet Shop stocks a variety of lifting slings suitable for a number of different applications and projects, all of which comply with all regulations and safe Working Load Limits. These include webbing slings, in options from 1000kgs to 10,000kgs, as well as round slings ranging from 1000kgs to 8,000kgs. There are many different names for webbing and round slings, including lifting slings, strops, soft slings, and woven slings. They provide a safe and reliable product when compared to other options, with a safety factor of seven times the rated Working Load Limit (WLL). The soft material of the lifting slings also prevents many of the common injuries, such as cuts from sharp edges or broken wires. If you have any specific requirements when it comes to purchasing lifting equipment contact our office for more information, or browse through our product range using the categories below. 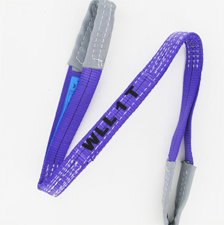 Here at The Ratchet Shop we stock a wide range of webbing slings and round slings, all of which are made from high quality, reliable polyester. 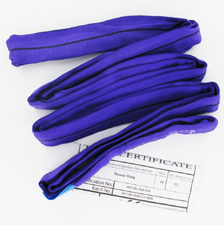 Polyester is a synthetic man made material that works particularly well in sling applications, thanks to its enviable combination of a lightweight overall nature paired with impressive, and somewhat surprising, strength. These properties have meant that it has long been chosen over chain, wire rope and other potential materials that had previously been popular when it came to traditional lifting equipment. There are many different names for webbing and round slings, including lifting slings, strops, soft slings, and woven slings. Lifting slings are usually made up of a couple of different components, potentially including metal elements like hooks, shackles and rings, paired with the polyester webbing sling part of the device. These elements come together to form a strong, reliable lifting sling that is suitable for a number of different applications across a variety of industries. Why would you use lifting slings? Lifting slings are an excellent choice if you’re looking for safe and reliable lifting equipment that is going to stand the test of time. When compared to more traditional lifting equipment materials, such as chain or wire rope, webbing slings are far safer - both for the person operating the slings and the materials being lifted. This is because the softer material of the sling avoids cuts and injuries from sharp edges, as well as reducing damage to the products they are lifting. They were specifically developed to prevent surface damage when lifting objects, which makes them an excellent choice if you’re looking to lift expensive items or things that have a delicate element -such as a newly painted surface. The softer material reduces friction during the lifting process and helps to ensure that excellent condition and quality control is maintained. Not only are webbing lifting slings unlikely to cause damage, they are also easy to move and position. This is due to the sizeable reduction in overall weight of the lifting gear, when comparing chain or rope slings with the lighter, more flexible webbing varieties.